Have you visited the Frances Perkins Homestead yet? 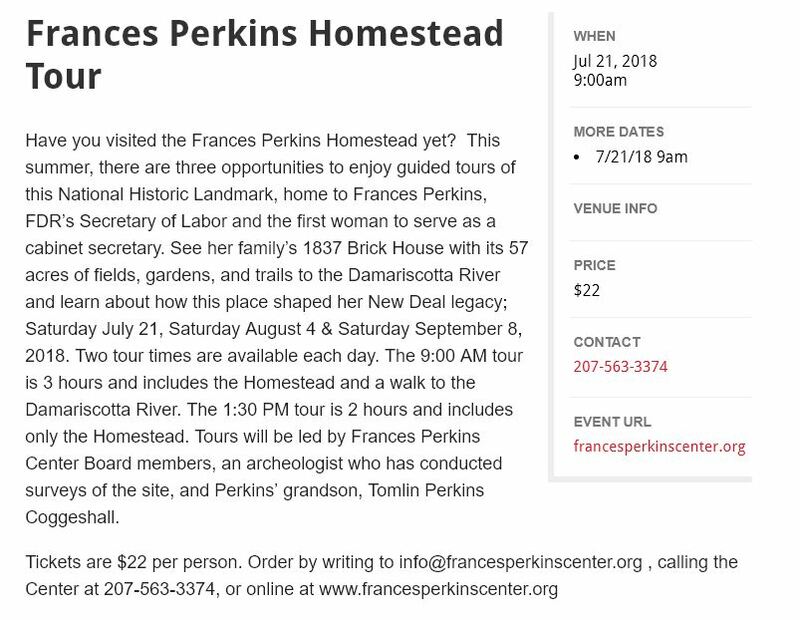 This summer, there are three opportunities to enjoy guided tours of this National Historic Landmark, home to Frances Perkins, FDR’s Secretary of Labor and the first woman to serve as a cabinet secretary. See her family’s 1837 Brick House with its 57 acres of fields, gardens, and trails to the Damariscotta River and learn about how this place shaped her New Deal legacy; Saturday July 21, Saturday August 4 & Saturday September 8, 2018. Two tour times are available each day. The 9:00 AM tour is 3 hours and includes the Homestead and a walk to the Damariscotta River. The 1:30 PM tour is 2 hours and includes only the Homestead. Tours will be led by Frances Perkins Center Board members, an archeologist who has conducted surveys of the site, and Perkins’ grandson, Tomlin Perkins Coggeshall.